I was going for a run one day, up through the woods onto the track to the open tops of the South Downs near where we live. That's where I had the initial idea. Running is good like that, ideas come from out of the blue. I just thought I'd love to make a film about Hardy's, they were such an interesting, enigmatic and iconic name. The idea had not come from totally out of the blue. I had wanted to buy a spare rod, just to have handy for when I can persuade visitors to come along for a spot of fishing. But I thought hmm maybe I can buy something a little different and let the visitors use my own rod. I wondered what would I like and remembered that I'd always wanted a cane rod for dry fly fishing when I was a kid so why not try a second hand one. There are probably lots of reasons not to buy a second hand one but it was an old itch and I was keen to scratch, even if only to consign it to the dustbin of the past. Ebay beckoned and I could not believe just how many used cane rods were out there. So a week or so later our grinning postie knocked on our door with a Hardy Palakona Perfection. It was a lovely old clunker too. Luckily I'd missed the advent of the more modern carbon in my 20 year absence from angling so I had no real idea of what I was missing in the modern high tech stakes. Probably just as well. Anyhows what really struck me was that the rod came in the original bag and with the original oiled label. A 50 year old rod, older than me and with the label still attached. It cost me about £55, probably about the same as it cost when new but goodness has the world changed since then. That rod and it's dried out oil label became to me a touching link with the past. The seed for all of my films start like that, some little curiosity, a tick that grows into a idea and through this a film develops. I got back from my run and related my thoughts to Heike my producer. She happened to be in the back garden ruminating over the chalky spots that were appearing on the courgette leaves. Surprisingly there was no snort of derision, she's very encouraging like that. Instead she hummed it over and we said no more for a while. We both just thought hmm, there is a film in there but how can we get it made? 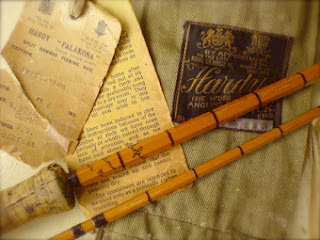 In May 2006 I had the idea that I'd like to make a documentary film based around Hardy's, the fishing tackle company. I had come back to angling after many years away and found it such a reassuring surprise that the name Hardy's, a name so prevalent in my youth and 80 years before that, still meant so much to thousands and thousands of people all over the world. I always was and still am interested in the idea of why they became so popular, why they meant so much to so many people and also in discovering how much fishing has changed in the years since they came on the scene. I quickly became absorbed and passionate about making the film but with many years of filmmaking under my belt I was also aware of the difficulty in finding a broadcaster who would be interested. Later that month we, as in myself and my producer Heike, took a trip to Cannes for the film festival. We also have a feature film project called "Captain Kirk" and we were there to finance this. Whilst suffering down at Cannes (no irony intended, its really not as glamorous as people would have you believe) we hit upon a way to make our film. The method was great, simple and very modern - for us it was really exciting as it meant we could set sail on a year long odyssey to make The Lost World of Mr. Hardy. The blog will gradually build to tell all about the film and how we made it and our journey across the UK from the Summer of 06 until March this year and into the edit room where I now sit. As we add to the blog we hope it brings across the passion and enthusiasm of the people we met, the love of Hardy's and for fishing tackle of the very highest quality, the importance of the hand made in our lives, of angling, the countryside, conservation, history and even for films themselves... Hmmm, no pressure there then, so better get started.